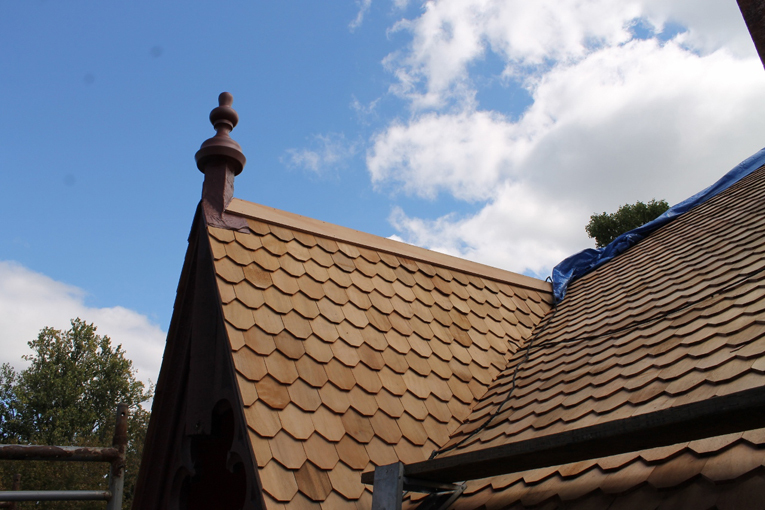 A distinctive feature of the roof replacement project at Roseland Cottage in Woodstock, Connecticut, is the return of the shaped shingle. In 1845, Henry Bowen, the business leader who built the property as a summer home for his family, wrote out specific instructions for many of the details of his house for the builder, Samuel Underwood of Pomfret, Connecticut: “The roof of the main building to be covered with the best quality…cedar shingles….brought to an even width on each side of the house and the corners taken off thus…” At this point in the document, there is a small sketch illustrating the point. 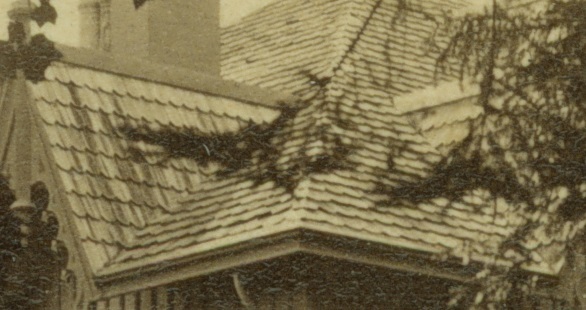 This c. 1880 stereoscopic card shows, on the southeast corner of the house, what the roof looked like with those shingles. 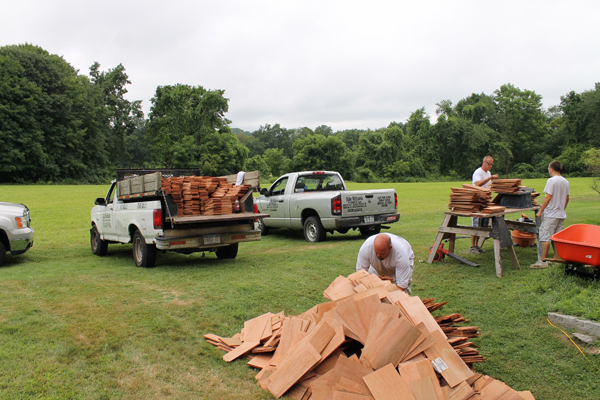 In order to create the same effect in 2013, approximately 13,000 western red cedar shingles were processed on site to create shingles of a consistent six-inch width with forty-five-degree bevels at the corners. The result of this research and field work is beginning to take shape, and the north face of the roof has been graced with new shingles. The Roseland Cottage roof project is partially funded with the assistance of a matching grant from the Connecticut Historic Restoration Fund through the state’s Department of Economic and Community Development. Historic New England is actively fundraising to make up the difference between the funding and the project cost. Your contribution to the Preservation Maintenance Fund helps maintain these important features of our historic properties.